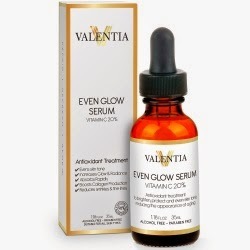 I love this even glow serum it makes your skin look so even and with all the lines i have on my forehead and now I am getting crow's feet it's not a pretty sight to me. And I know for a fact my skin is not going to look like I am 21 years old again. You grow older and change and so does your skin!! I was really excited to try out this serum from Valentia.